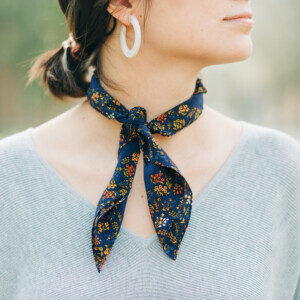 Neck scarves are everywhere these days, and for good reason. You can style them any way you want to easily add flair to your favorite outfits. 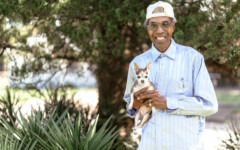 This style works best with a smaller, square neck scarf and goes with just about any type of shirt or outfit. To get this look, fold your scarf into one long rectangle. Wrap twice around your neck and tie in the front. 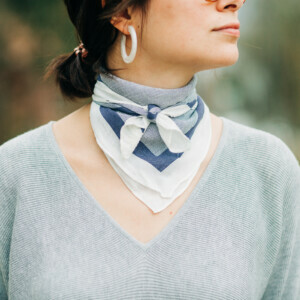 A simple, stately way of wearing a neck scarf. 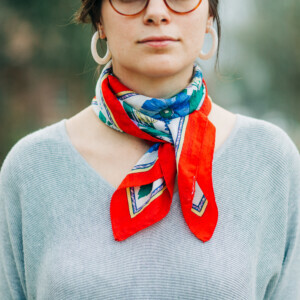 For this style, simply fold or roll your scarf into one long, rectangular piece (it should be skinny) and tie loosely around your neck, leaving the knot and ends in the front. 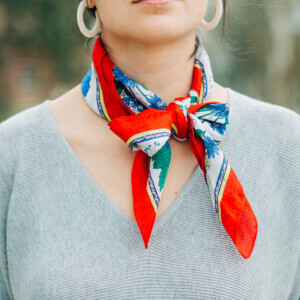 Use a large silk neck scarf and fold it in half. Then, starting with the straight folded side, fold inward toward the point until the scarf is one long folded rectangle. 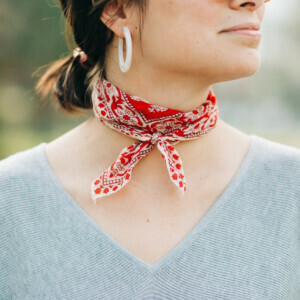 Wrap scarf around neck once and bring ends to the front, crossing one over the other and adjusting. Much like our favorite early 2000s neck accessory, this style is no-nonsense while still adding a little something extra to your outfit. Fold your scarf into a long, skinny rectangle and wrap twice around your neck. Tie the ends together in the back and tuck them in. The bandana style of this look makes it a good choice for when you’re wearing a v-neck or scoop-neck top. Fold your scarf in half and fold the straight side inward about halfway. 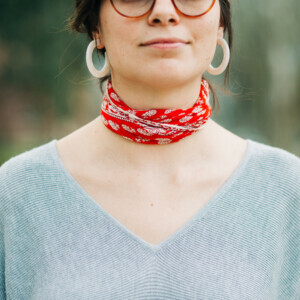 With the fold facing inward, wrap around your neck and tie ends on top in the front. If you really want to get playful or make a bold statement, try tying your scarf into a bow. Starting by folding and wrapping the scarf like you did for The Bandana, but instead of tying a knot in the front, tie a bow.